The average O&M cost of wastewater treatment at Al-Aroub station in 2016 was 0.4 EURO/m3. The two major items increasing the cost of wastewater treatment in Palestine and in the MENA region in general, are the improper management of the generated sludge and the consumption of electricity. At Al-Aroub WWTP, sludge is thickened to 2.5% dry solid (DS) content using gravity thickener and is then transported in vacuum tankers for final disposal at Al-Minya sanitary landfill. The cost of thickened sludge transport and disposal is approximately 7.7 EURO per m3 (equivalent to 0.16 EURO/m3 of treated wastewater). The high financial and environmental costs of generated sludge disposal are problematic not only at Al-Aroub wastewater treatment plant but also for most wastewater treatment plants in developing countries including these in the Middle East and North Africa (MENA) region. In Palestine, none of the wastewater treatment plants have facilities for dewatering and stabilizing the generated sludge and while most of the generated sludge in Egypt and Jordan is dewatered to concentrations of 40-60 % DS, the generated sludge is rarely stabilized and thus does not fit Egyptian, Jordanian, or international standards, especially pathogen limits. Another major contributor to the operational cost of wastewater treatment plants is energy consumption. The current energy consumption at Al-Aroub wastewater treatment plant is 23.8 kWh per p.e. However, the high retail price of electricity in Palestine (EUR 0.16/kWh), which is the highest in the Middle East Region, escalates the operational cost of treatment. The cost of electricity currently accounts for 32% of the total O&M costs at Al-Aroub wastewater treatment plant. 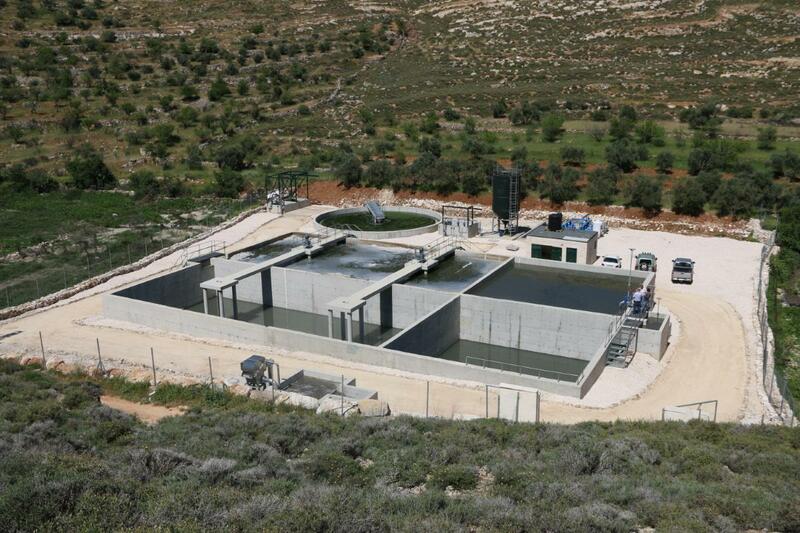 The project’s overall objective is to promote wastewater treatment and reuse in the water scarce areas of the Middle East and North Africa (MENA) by developing scalable and innovative financial instruments and inclusive management plans that can fully recover the costs of wastewater treatment and reuse at a demonstration site in Wadi Al-Arroub, Palestine. Protection of the environment by conversion of destabilized sludge into a marketable product that can be safely used to improve the physical and chemical characteristics of soils in rangelands and croplands. A cost-saving and water efficient irrigation system is installed, economic water productivity is increased and many other benefits.